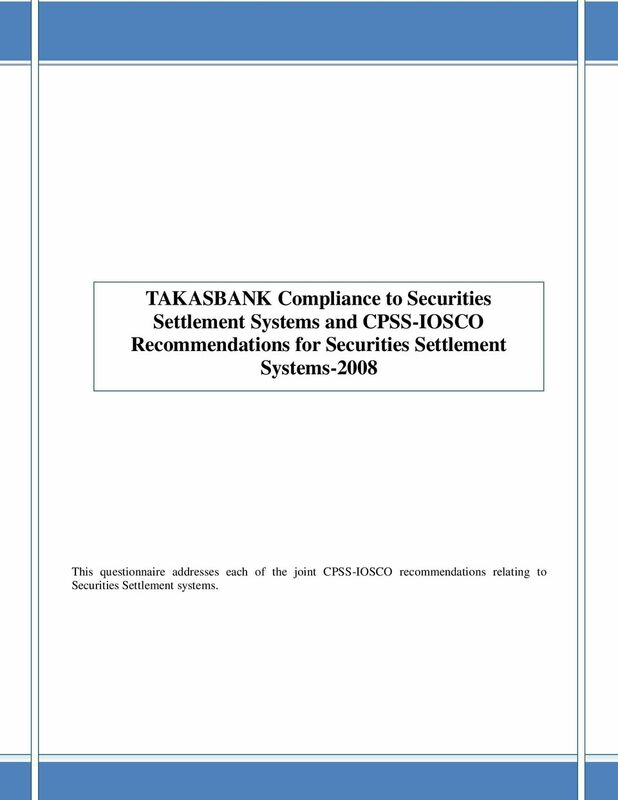 Download "TAKASBANK Compliance to Securities Settlement Systems and CPSS-IOSCO Recommendations for Securities Settlement Systems-2008"
2 Recommendation 1: Legal framework Securities settlement systems should have a well-founded, clear and transparent legal basis in the relevant jurisdictions. 1. Are the laws, regulations, rules and contractual provisions of the jurisdiction and of the system governing securities settlement arrangements and related pre-settlement and securities lending arrangements (including repurchase agreements and other economically equivalent transactions) public and readily accessible to system participants? Yes. The Capital Markets Law, Related Decrees of the Capital Markets Board, Settlement Regulations of the Istanbul Stock Exchange, Operational Rules and Regulations regarding Settlement and Custody that are announced by Takasbank, are available in printed form. These are also available via relevant web sites of these institutions ( Does the legal framework support: (a) the enforceability of transactions? Yes. Takasbank is authorized by the Capital Markets Board (CMB) and the Istanbul Stock Exchange (ISE) as the Clearing and Settlement Institution for the ISE markets. Participants of Takasbank are also subject to same authorities, relevant laws, and related rules and regulations. Since Takasbank carries out clearing and settlement of all organized market trades that take place at the ISE, the trading parties should comply with trading and settlement rules of those organized markets. Therefore transactions are enforceable. (b) the protection of customer assets (particularly against insolvency of custodians and intermediaries)? Yes. All equities are dematerialized on Customer Name Based Custody System within the Central Registry Agency (CRA), the Central Securities Depository for equities. Customer Name Based Custody System oversees a two tier level of custody records, in the first level for intermediaries and in the second level for customers of these intermediaries. Customer Name Based Custody System s records are recognized as the proof of ownership and therefore protects the customer assets against any attachment on the intermediary assets. As for the insolvency of a custodian, rules are clearly defined in the Capital Markets Law No: 46 p.2 and 5. The Law, which states that in case of the prevention of participants operations by the Capital Markets Board due to the financial weakness or insolvency of the participant, client assets are protected against the participant s creditors. Such participant's clients, would access their holdings through the Investment Protection Fund which will be in charge of carrying out the liquidation process after the gradual liquidation decision is taken by the Capital Markets Board. The data out of the Customer Name Based Custody System is accepted as the official data by the Investor Protection Fund, which protects the assets of the customers against the claims of the insolvent custodian s creditors. In case of the loss of any client of the participant which is subject to progressive and administrative liquidation, indemnification out of the Investment Protection Fund is set forth. 3 (c) the immobilization or dematerialization of securities and the transfer of securities by book entry? Yes. The legal framework supports dematerialization of securities and the transfer of securities by book entry. Dematerialization: The Capital Markets Law was amended in December 1999 to regulate general aspects of the dematerialization of securities in Turkey. Capital markets instruments and the rights linked to these are kept on computer environment by a central registry. The Central Registry Agency (CRA), acting as the central registrar for the dematerialized securities market in Turkey, was established and received commercial registration in September Securities were dematerialized as of 28 November 2005 and Central Registry Agency (CRA) is the Central Depository for Equities. Takasbank has 65% shareholdership in the CRA. 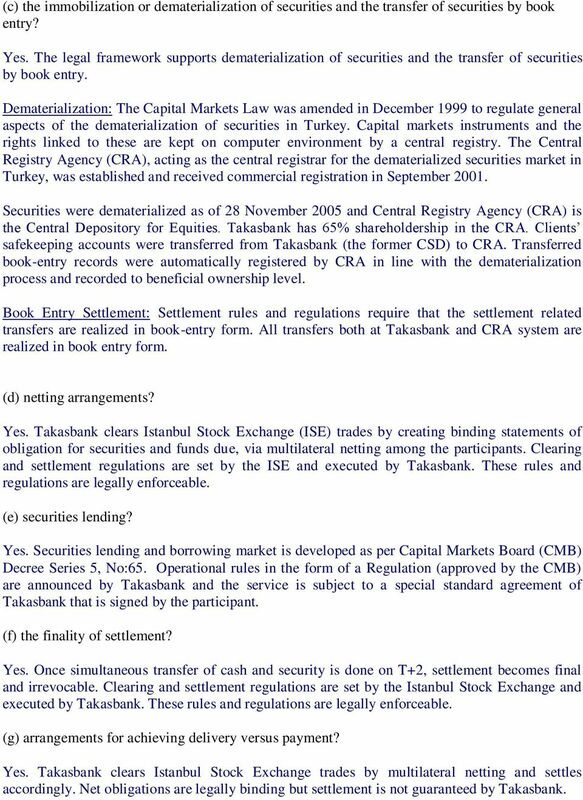 Clients safekeeping accounts were transferred from Takasbank (the former CSD) to CRA. Transferred book-entry records were automatically registered by CRA in line with the dematerialization process and recorded to beneficial ownership level. Book Entry Settlement: Settlement rules and regulations require that the settlement related transfers are realized in book-entry form. All transfers both at Takasbank and CRA system are realized in book entry form. (d) netting arrangements? Yes. 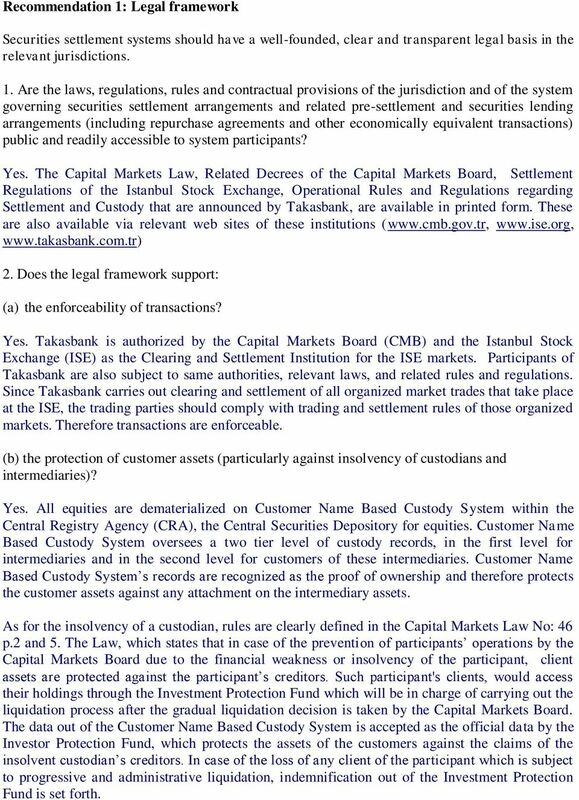 Takasbank clears Istanbul Stock Exchange (ISE) trades by creating binding statements of obligation for securities and funds due, via multilateral netting among the participants. Clearing and settlement regulations are set by the ISE and executed by Takasbank. These rules and regulations are legally enforceable. (e) securities lending? Yes. Securities lending and borrowing market is developed as per Capital Markets Board (CMB) Decree Series 5, No:65. Operational rules in the form of a Regulation (approved by the CMB) are announced by Takasbank and the service is subject to a special standard agreement of Takasbank that is signed by the participant. (f) the finality of settlement? Yes. Once simultaneous transfer of cash and security is done on T+2, settlement becomes final and irrevocable. Clearing and settlement regulations are set by the Istanbul Stock Exchange and executed by Takasbank. These rules and regulations are legally enforceable. (g) arrangements for achieving delivery versus payment? Yes. Takasbank clears Istanbul Stock Exchange trades by multilateral netting and settles accordingly. Net obligations are legally binding but settlement is not guaranteed by Takasbank. 4 DVP is applied as members do not get their receivables unless they fulfill their obligations. In case of partial fulfillment of the obligation, proportional payment/transfer out of the receivable is made to the member. Clearing and settlement regulations are set by the Istanbul Stock Exchange and executed by Takasbank. These rules and regulations are legally enforceable. (h) rules addressing the consequences of a participant s default? Yes. The default procedures are executed by Takasbank upon regulations set by the Istanbul Stock Exchange(ISE). These rules and regulations are legally enforceable. (i) the liquidation of assets pledged or transferred as collateral to support participants obligations? Yes. The liquidation of assets pledged are carried out along with the rules and regulations of ISE. Upon multilateral netting among the participants, DVP principle is applied and the participants receivables are pledged against their obligations. 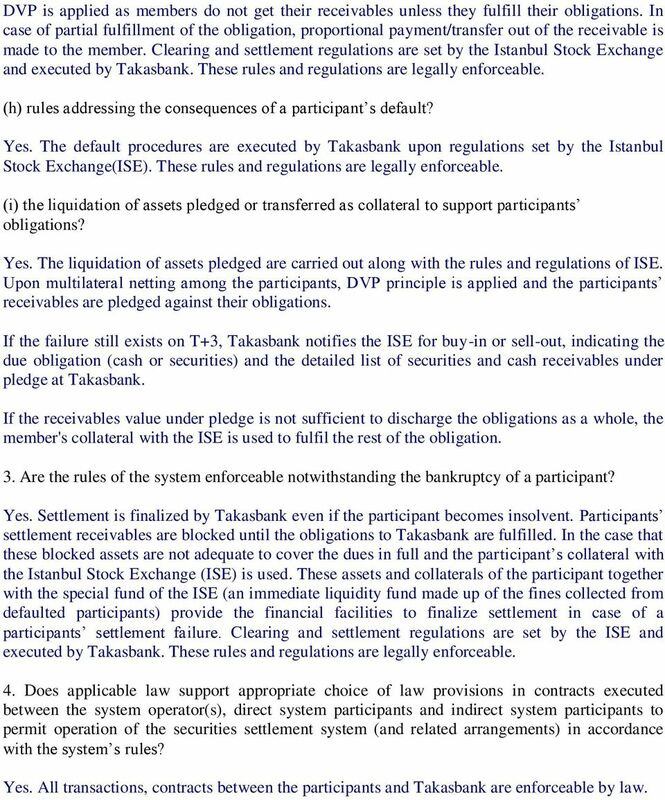 If the failure still exists on T+3, Takasbank notifies the ISE for buy-in or sell-out, indicating the due obligation (cash or securities) and the detailed list of securities and cash receivables under pledge at Takasbank. If the receivables value under pledge is not sufficient to discharge the obligations as a whole, the member's collateral with the ISE is used to fulfil the rest of the obligation. 3. Are the rules of the system enforceable notwithstanding the bankruptcy of a participant? Yes. Settlement is finalized by Takasbank even if the participant becomes insolvent. Participants settlement receivables are blocked until the obligations to Takasbank are fulfilled. In the case that these blocked assets are not adequate to cover the dues in full and the participant s collateral with the Istanbul Stock Exchange (ISE) is used. These assets and collaterals of the participant together with the special fund of the ISE (an immediate liquidity fund made up of the fines collected from defaulted participants) provide the financial facilities to finalize settlement in case of a participants settlement failure. Clearing and settlement regulations are set by the ISE and executed by Takasbank. These rules and regulations are legally enforceable. 4. Does applicable law support appropriate choice of law provisions in contracts executed between the system operator(s), direct system participants and indirect system participants to permit operation of the securities settlement system (and related arrangements) in accordance with the system s rules? Yes. All transactions, contracts between the participants and Takasbank are enforceable by law. 5 5. Are jurisdictions other than the jurisdiction in which the system is established relevant for determining the adequacy of the legal framework? How has this been determined? Has the legal framework been evaluated for the other relevant jurisdictions? As per clearing and settlement activities, The Capital Markets Law is applicable to Takasbank operations. Since Takasbank is established as a bank, it is also subject to Banking Law. The legal framework has to be in line with these laws. The bank is audited regularly by both Capital Markets Board and Banking Regulation and Supervision Agency and is adequate and in line with laws. 6. Has a court in your jurisdiction ever failed to enforce a contract concluded through an SSS? If so, what contract and for what reasons? No. Recommendation 2: Trade confirmation Confirmation of trades between direct market participants should occur as soon as possible after trade execution, but no later than trade date (T+0). Where confirmation of trades by indirect market participants (such as institutional investors) is required, it should occur as soon as possible after trade execution, preferably on T+0, but no later than T Are trades between direct market participants confirmed through a system provided by a stock exchange, trade organization, CCP or other central entity? What is the process for confirming such trades? Yes. Equities are not permitted to be traded over the counter and the ISE Equities Market is the sole market in Turkey where equities can be traded. Trading system of the ISE is an automated order entry system and trade contracts are legally binding. 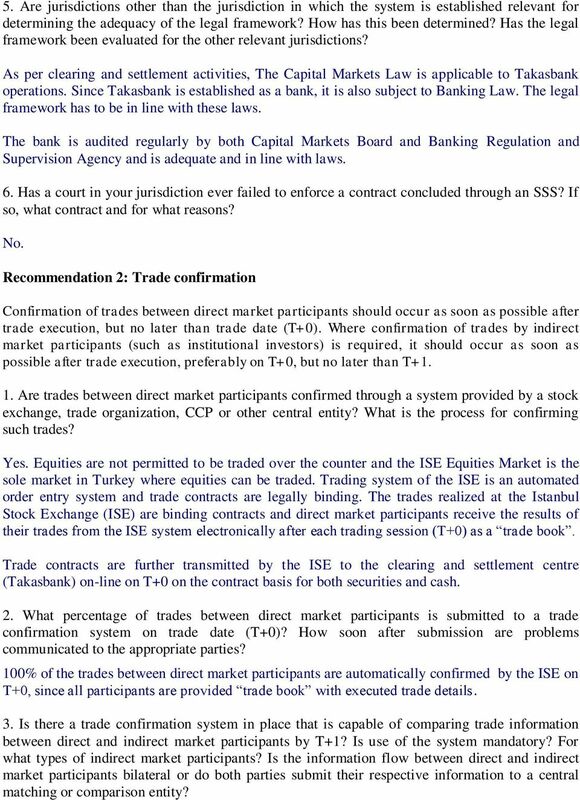 The trades realized at the Istanbul Stock Exchange (ISE) are binding contracts and direct market participants receive the results of their trades from the ISE system electronically after each trading session (T+0) as a trade book. Trade contracts are further transmitted by the ISE to the clearing and settlement centre (Takasbank) on-line on T+0 on the contract basis for both securities and cash. 2. What percentage of trades between direct market participants is submitted to a trade confirmation system on trade date (T+0)? How soon after submission are problems communicated to the appropriate parties? 100% of the trades between direct market participants are automatically confirmed by the ISE on T+0, since all participants are provided trade book with executed trade details. 3. Is there a trade confirmation system in place that is capable of comparing trade information between direct and indirect market participants by T+1? Is use of the system mandatory? For what types of indirect market participants? Is the information flow between direct and indirect market participants bilateral or do both parties submit their respective information to a central matching or comparison entity? 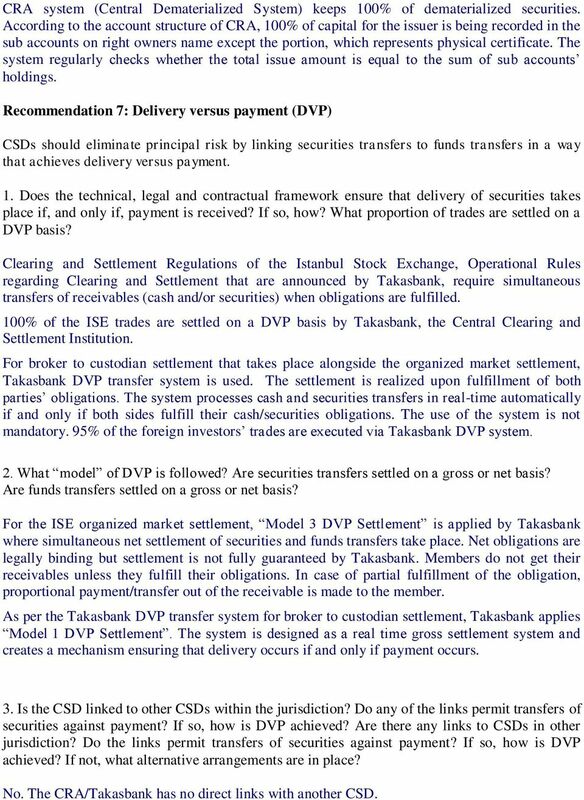 6 There is a separate but linked (to ISE settlement) DVP settlement system operated by Takasbank where mainly indirect participants settle with direct and indirect participants. In this system, settlement instructions are required to be matched. The use of this system is not mandatory. Custodian banks, investment funds, mutual trusts, pension funds, portfolio management companies are indirect market participants and can use the DVP system. Especially foreign institutional investors transactions are settled via DVP facility. Mutual funds and investment trusts are required by the Capital Markets Board to be informed to the trading system by the broker during the trade order entry. These indirect participants can reach trade and settlement data at Takasbank relating to their transactions by T What percentage of trades between indirect market participants is confirmed on trade date? By the contractual settlement date? Of those trades involving indirect market participants for which confirmation is required, what percentage is confirmed by T+0, by T+1, by the contractual settlement date? The trades of mutual funds, pension funds and investment trusts, which are executed by the broker at the ISE organized market, can be confirmed 100% via Takasbank system on T+1 morning. 95% foreign institutional investors trades, which are actually executed by the broker at the ISE, are confirmed on T+2. For most of these transactions, Takasbank DVP facility is used by the brokers and the custodians of the foreign investors. 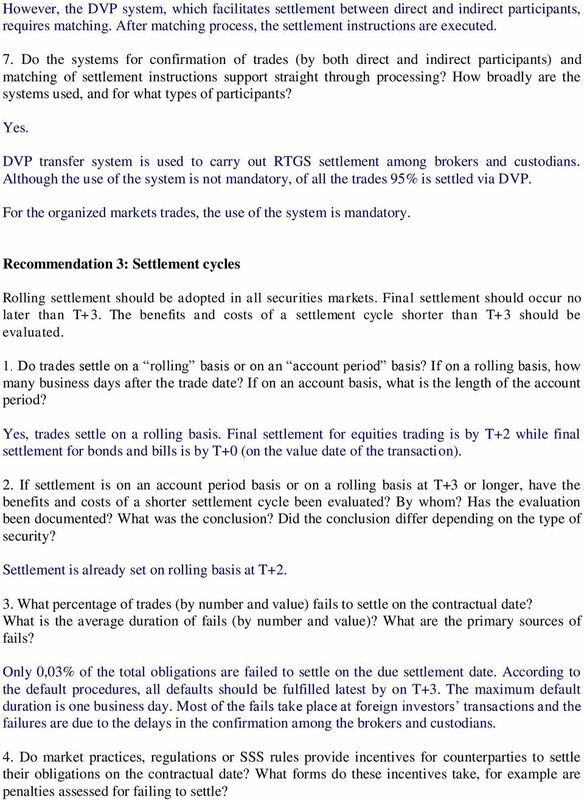 Currently, the confirmation takes place on T+2, but the enhancements at the system is being developed to provide confirmation on T+1 for DVP settlement (among brokers and custodians) for equities. 5. What are the primary reasons for trades between direct market participants and between direct and indirect market participants not confirming successfully? What percentage of unconfirmed trades is resolved prior to the settlement date? How are unconfirmed trades dealt with? All direct participants confirm on the trade date successfully. The unconfirmed trades are due to the lack of instructions, which should be received from the foreign institutional investors to their custodians or brokers. 6. What is the process for matching settlement instructions? How is matching of settlement instructions linked with trade confirmation? 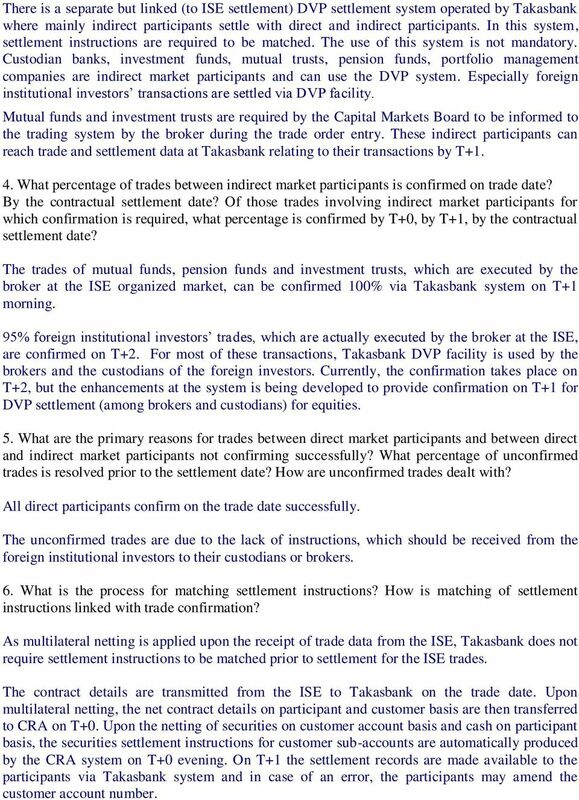 As multilateral netting is applied upon the receipt of trade data from the ISE, Takasbank does not require settlement instructions to be matched prior to settlement for the ISE trades. The contract details are transmitted from the ISE to Takasbank on the trade date. Upon multilateral netting, the net contract details on participant and customer basis are then transferred to CRA on T+0. Upon the netting of securities on customer account basis and cash on participant basis, the securities settlement instructions for customer sub-accounts are automatically produced by the CRA system on T+0 evening. On T+1 the settlement records are made available to the participants via Takasbank system and in case of an error, the participants may amend the customer account number. 7 However, the DVP system, which facilitates settlement between direct and indirect participants, requires matching. After matching process, the settlement instructions are executed. 7. Do the systems for confirmation of trades (by both direct and indirect participants) and matching of settlement instructions support straight through processing? How broadly are the systems used, and for what types of participants? Yes. DVP transfer system is used to carry out RTGS settlement among brokers and custodians. Although the use of the system is not mandatory, of all the trades 95% is settled via DVP. For the organized markets trades, the use of the system is mandatory. Recommendation 3: Settlement cycles Rolling settlement should be adopted in all securities markets. Final settlement should occur no later than T+3. The benefits and costs of a settlement cycle shorter than T+3 should be evaluated. 1. Do trades settle on a rolling basis or on an account period basis? If on a rolling basis, how many business days after the trade date? If on an account basis, what is the length of the account period? Yes, trades settle on a rolling basis. Final settlement for equities trading is by T+2 while final settlement for bonds and bills is by T+0 (on the value date of the transaction). 2. If settlement is on an account period basis or on a rolling basis at T+3 or longer, have the benefits and costs of a shorter settlement cycle been evaluated? By whom? Has the evaluation been documented? What was the conclusion? Did the conclusion differ depending on the type of security? Settlement is already set on rolling basis at T What percentage of trades (by number and value) fails to settle on the contractual date? What is the average duration of fails (by number and value)? What are the primary sources of fails? Only 0,03% of the total obligations are failed to settle on the due settlement date. According to the default procedures, all defaults should be fulfilled latest by on T+3. The maximum default duration is one business day. Most of the fails take place at foreign investors transactions and the failures are due to the delays in the confirmation among the brokers and custodians. 4. Do market practices, regulations or SSS rules provide incentives for counterparties to settle their obligations on the contractual date? What forms do these incentives take, for example are penalties assessed for failing to settle? 8 All equities are traded at the organized market of the ISE, thus default procedures are applied to failed trades. In case of a failure of a participant to fullfil its obligation by the specified deadline on due date, Takasbank applies the default procedure. The default penalty payment is calculated on the prevailing market overnight interest rate (highest of the ISE repo/reverse repo market or the Central Bank of Turkey). The penalty payment calculation will be applied as follows: If defaulted obligations are fulfilled on T+2 within the working hours of the Central Bank s national payment system (EFT), default payment calculations will be calculated on the prevailing market overnight interest rate, as described above. If the failure still exists on T+3, penalty payment is calculated as a triple of the prevailing market overnight interest rate applied throughout the failure period, as described above. For fulfillment of obligations after the date of settlement, the ISE extends an inquiry to the member asking the reasons for the failure. If the failure still exists on T+3, Takasbank notifies the ISE for buy-in or sell-out, indicating the due obligation (cash or securities) and the detailed list of securities and cash receivables remained under blockage at Takasbank. Blockage is set on the receivables (of T+2) by the end of T+1 and calculated by the prevailing market value of the original net obligations on T+1. The payment and securities obligations arising from the trade related with the buy-in or sell-out process are settled on the same day (T+3). If the receivables value under pledge is not sufficient to discharge the obligations as a whole, the member's collateral with the ISE is used to fulfill the rest of the obligation. 5. What steps, if any, are taken to mitigate the risks of fails? Are fails required to be marked to market? Are open positions required to be closed out at market prices if the duration of the fail exceeds a specified number of business days? What entity or entities establish, monitor and enforce these requirements? Although settlement is not guaranteed, Takasbank carries out the failure management to cover settlement fails. 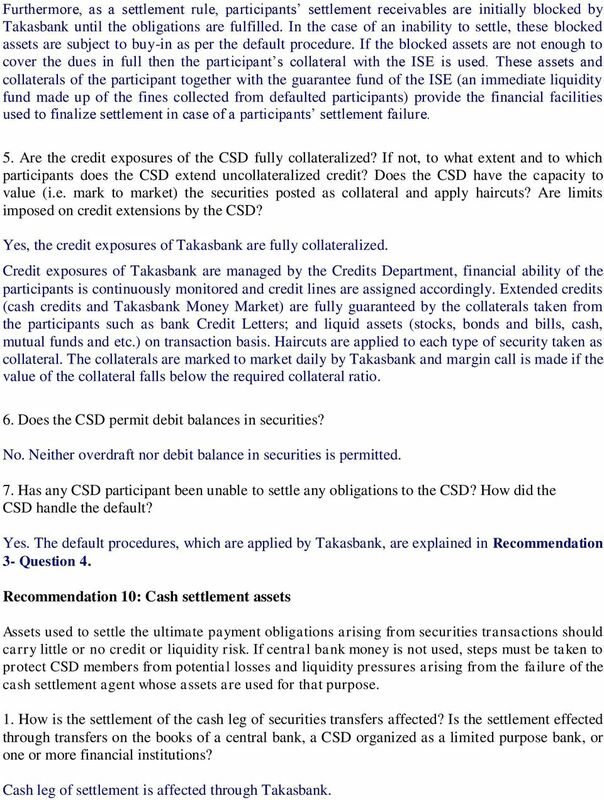 (the default procedures applied by Takasbank are explained in Recommendation 3, Question 4) There is also a special fund of the ISE managed and used by Takasbank (made up of the fines collected from participants for failed transactions), that is intended to provide the initial liquidity to the settlement and to cover shortfalls that may lead to settlement fails. The financial limit of this best effort guarantee is the prevailing value of this fund (e.g. USD40 million as of August 2008). Istanbul Stock Exchange sets the clearing and settlement regulations as well as default procedures and enforce the requirements. Operations relating to failure management is carried out by Takasbank. 9 Recommendation 4: Central counterparties (CCPs) The benefits and costs of a CCP should be evaluated. Where such a mechanism is introduced, the CCP should rigorously control the risks it assumes. 1. Has a CCP mechanism (or an indemnification arrangement) been introduced? If so, what types of securities and market participants are covered? When does the CCP interpose itself between its participants to assume the role of guarantor to each trade? No. However, Takasbank clears the ISE trades by multilateral netting and specifies the dues and receivables of the direct participants for the settlement date. On the settlement date, all parties fulfill their obligations to Takasbank and get their receivables from Takasbank. Although settlement is not guaranteed, Takasbank applies default procedure in case of a failure of any participant. Therefore, we can say that Takasbank acts as a CCP operationally. 2. If no such mechanism has been introduced, have the benefits and costs of such a mechanism been evaluated? By whom? Has the assessment been documented? What was the conclusion? Benefits and costs of guaranteeing settlement has been evaluated by Takasbank in 2001 with an assesment report. Financial costs to participants related with guaranteeing the settlement, was concluded to be high and therefore might impede the capital market activities as a whole. As the failure rates are also so low, the result was to delay setting up such mechanisms for that moment. Setting up such a settlement guarantee mechanism will be subject to the decision of the Capital Markets Board and the Istanbul Stock Exchange. 3. Does the CCP impose financial and operational standards for participation? Takasbank does not impose financial and operational standards for the participants. The settlement participants are the ISE members and these members have already provided CMB laws to operate at the ISE. 4. How does the CCP manage its credit risk vis-à-vis participants? Does it require participants to collateralize their exposures? How often are requirements recomputed and collateral collected? Takasbank acts as a CCP operationally and do not impose risk on its capital for the finalization of settlement. It doesn t require participants to collateralize their exposures. However, participants settlement receivables are blocked until they fulfill their obligation to Takasbank. Besides, participants are required to maintain collateral with the ISE and the calculation of the collateral is handled by the ISE periodically These assets of the participant together with the special fund of the ISE provide the financial facilities to finalize settlement in case of a participants settlement failure. 10 5. What are the financial resources of the CCP? How does the CCP assess the adequacy of the size and liquidity of its financial resources? Does it require participants to contribute to a clearing or guarantee fund? Does the CCP have legally enforceable interests in or claims on the assets in the fund? Does the CCP have transparent and enforceable loss allocation rules? NA. 6. How does the CCP manage its liquidity risk? Does the CCP have in place agreements permitting it to borrow against collateral? 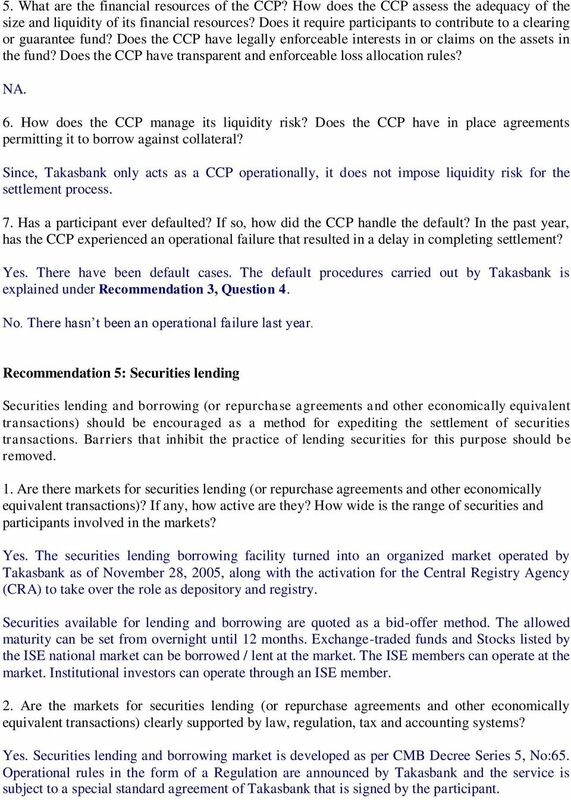 Since, Takasbank only acts as a CCP operationally, it does not impose liquidity risk for the settlement process. 7. Has a participant ever defaulted? If so, how did the CCP handle the default? In the past year, has the CCP experienced an operational failure that resulted in a delay in completing settlement? Yes. There have been default cases. 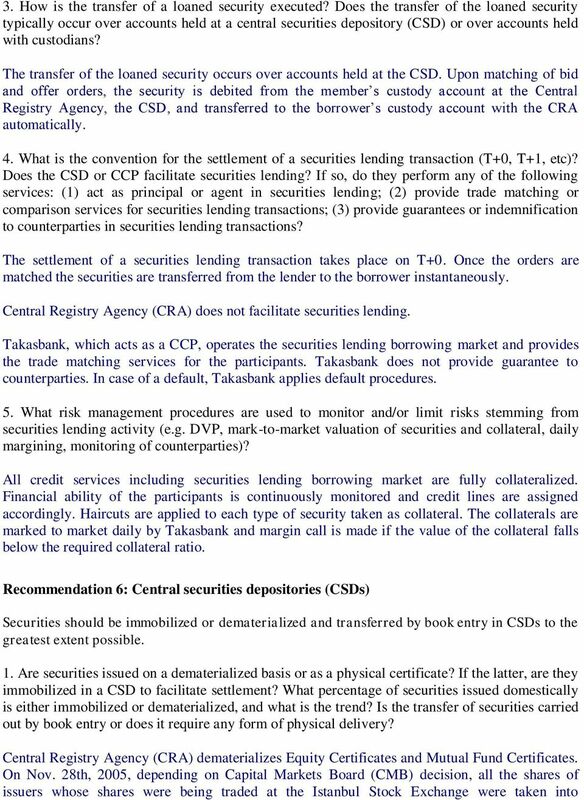 The default procedures carried out by Takasbank is explained under Recommendation 3, Question 4. No. There hasn t been an operational failure last year. Recommendation 5: Securities lending Securities lending and borrowing (or repurchase agreements and other economically equivalent transactions) should be encouraged as a method for expediting the settlement of securities transactions. Barriers that inhibit the practice of lending securities for this purpose should be removed. 1. Are there markets for securities lending (or repurchase agreements and other economically equivalent transactions)? If any, how active are they? How wide is the range of securities and participants involved in the markets? Yes. The securities lending borrowing facility turned into an organized market operated by Takasbank as of November 28, 2005, along with the activation for the Central Registry Agency (CRA) to take over the role as depository and registry. Securities available for lending and borrowing are quoted as a bid-offer method. The allowed maturity can be set from overnight until 12 months. Exchange-traded funds and Stocks listed by the ISE national market can be borrowed / lent at the market. The ISE members can operate at the market. Institutional investors can operate through an ISE member. 2. Are the markets for securities lending (or repurchase agreements and other economically equivalent transactions) clearly supported by law, regulation, tax and accounting systems? Yes. Securities lending and borrowing market is developed as per CMB Decree Series 5, No:65. Operational rules in the form of a Regulation are announced by Takasbank and the service is subject to a special standard agreement of Takasbank that is signed by the participant. 12 dematerialization scope. At that date, client's safekeeping accounts were transferred from Takasbank to CRA. Those book entry records automatically registered by CRA in line with the dematerialization process and record keeping to beneficial owner level which covers 95% of free floating shares. Starting from Nov. 28 th, 2005 all the companies whose stocks are being traded in Istanbul Stock Exchange are obliged to issue new shares representing capital raises in dematerialized format in CRA system instead of printing physical certificates. Owners of physically held equities, are not able to trade them at the ISE unless these physical certificates are deposited in CRA and dematerialized. Physical certificates, which are dematerialized, are being kept to be annulled and destroyed. The deadline for depositing physical certificates in the CRA for dematerialization is 31 December Certificates which are not delivered before the end of the year 2007, will not be eligible for trading on exchanges after this date, can not be intermediated by intermediary institutions, and shall not be used in connection with repurchase certificates. The financial rights connected to these instruments will be monitored at the CRA and will be transferred to the accounts of the holders of the rights as soon as the certificates are delivered and the rights related to management recorded by the CRA. Dematerialization of the Mutual Fund Certificates was completed. All security transfers are carried out by CRA s Central Dematerialized System (CDS). However, if a stock which is not dematerialized is subject to any kind of transfer or trade, it should be dematerialized first by CRA. 2. What laws govern the book entry issuance, custody and transfer of securities? Do beneficial owners of securities have a direct property interest in identifiable securities or a claim against a pool of fungible securities? What ownership rights does an entry in the CSD confer? Is there an underlying register, and if so what is the legal status of a register entry? Is there a lag between settlement and registration and what are the implications of the time lag for finality? If the CSD is not the official registrar, does the transfer of securities in the CSD result automatically in the transfer of securities in the official register? Please refer to CRA 3. Is the issuance of securities centralized in a single CSD? If there are several CSDs, what are the criteria followed to determine which securities are issued in which CSD? Might a security be issued into, or held in, more than one CSD? 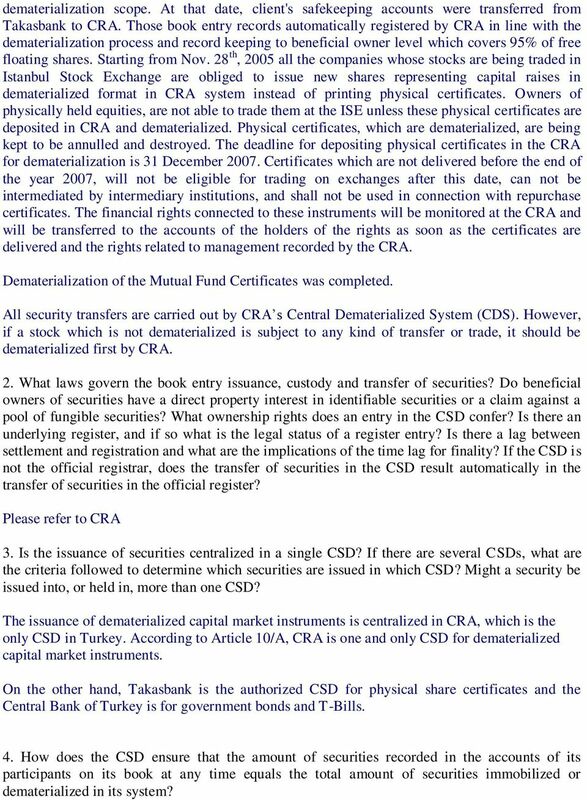 The issuance of dematerialized capital market instruments is centralized in CRA, which is the only CSD in Turkey. 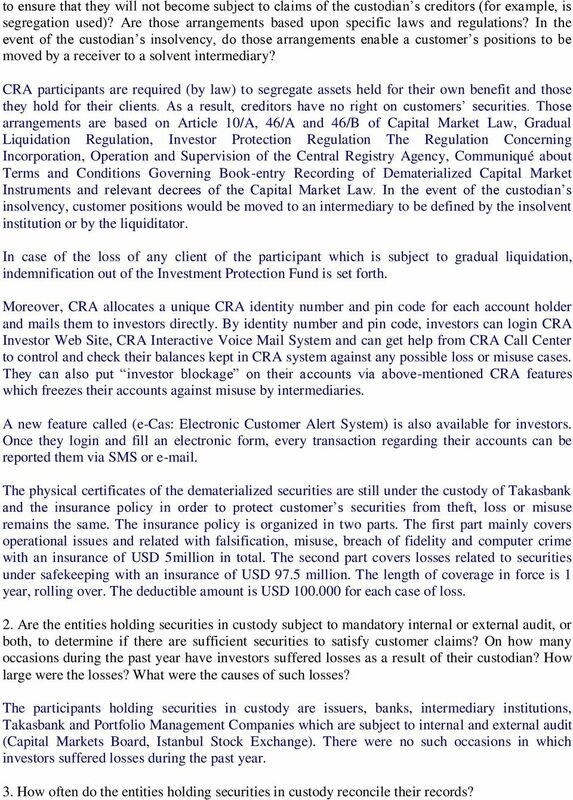 According to Article 10/A, CRA is one and only CSD for dematerialized capital market instruments. On the other hand, Takasbank is the authorized CSD for physical share certificates and the Central Bank of Turkey is for government bonds and T-Bills. 4. How does the CSD ensure that the amount of securities recorded in the accounts of its participants on its book at any time equals the total amount of securities immobilized or dematerialized in its system? 13 CRA system (Central Dematerialized System) keeps 100% of dematerialized securities. According to the account structure of CRA, 100% of capital for the issuer is being recorded in the sub accounts on right owners name except the portion, which represents physical certificate. The system regularly checks whether the total issue amount is equal to the sum of sub accounts holdings. Recommendation 7: Delivery versus payment (DVP) CSDs should eliminate principal risk by linking securities transfers to funds transfers in a way that achieves delivery versus payment. 1. Does the technical, legal and contractual framework ensure that delivery of securities takes place if, and only if, payment is received? If so, how? What proportion of trades are settled on a DVP basis? Clearing and Settlement Regulations of the Istanbul Stock Exchange, Operational Rules regarding Clearing and Settlement that are announced by Takasbank, require simultaneous transfers of receivables (cash and/or securities) when obligations are fulfilled. 100% of the ISE trades are settled on a DVP basis by Takasbank, the Central Clearing and Settlement Institution. For broker to custodian settlement that takes place alongside the organized market settlement, Takasbank DVP transfer system is used. The settlement is realized upon fulfillment of both parties obligations. The system processes cash and securities transfers in real-time automatically if and only if both sides fulfill their cash/securities obligations. The use of the system is not mandatory. 95% of the foreign investors trades are executed via Takasbank DVP system. 2. What model of DVP is followed? Are securities transfers settled on a gross or net basis? Are funds transfers settled on a gross or net basis? 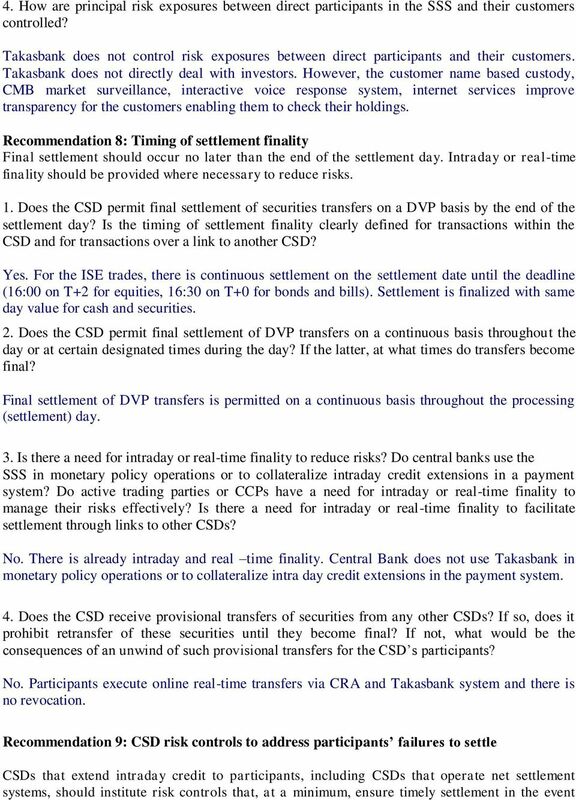 For the ISE organized market settlement, Model 3 DVP Settlement is applied by Takasbank where simultaneous net settlement of securities and funds transfers take place. Net obligations are legally binding but settlement is not fully guaranteed by Takasbank. Members do not get their receivables unless they fulfill their obligations. In case of partial fulfillment of the obligation, proportional payment/transfer out of the receivable is made to the member. As per the Takasbank DVP transfer system for broker to custodian settlement, Takasbank applies Model 1 DVP Settlement. The system is designed as a real time gross settlement system and creates a mechanism ensuring that delivery occurs if and only if payment occurs. 3. Is the CSD linked to other CSDs within the jurisdiction? Do any of the links permit transfers of securities against payment? If so, how is DVP achieved? Are there any links to CSDs in other jurisdiction? Do the links permit transfers of securities against payment? If so, how is DVP achieved? If not, what alternative arrangements are in place? No. The CRA/Takasbank has no direct links with another CSD. 15 that the participant with the largest payment obligation is unable to settle. The most reliable set of controls is a combination of collateral requirements and limits. 1. Does the CSD extend intraday credit to participants? Are the credit extensions explicit (usually in a gross settlement system) or implicit (in a net settlement system)? Central Registry Agency (CRA) does not extend any credits to participants. Takasbank, the Central Clearing and Settlement Institution, provides credits to ISE members. Takasbank Money Market, Securities Purchasing Loans (Cash Credits) and Securities Lending & Borrowing Market are aimed to ease the settlement for the participants. The credit extensions are implicit. 2. If the system is a net settlement system, would a failure of a participant to settle result in the reversal of transfers involving the defaulting participant and the recalculation of obligations of non-defaulting participants? Would all of the transfers involving the defaulting participant need to be reversed? When would the non-defaulting participants be informed of their recalculated obligations? When would they be required to meet the recalculated obligations? The system is a net settlement system. However, there is no reversal of transfers in case of a default. Please see Recommendation 3- Question 4 for default procedures. 3. What risk controls are in place to limit the likelihood of participants inability to settle and the losses and liquidity pressures in such settlement failures? Settlement is not financially guaranteed by any party. Takasbank acts as clearing agent for broker-to-broker transactions but does not guarantee these trades. However, settlement process is designed to settle both securities and funds on a net basis in order to reduce principal risk and minimize the need for members to maintain large balances throughout the settlement process. Settlement is executed on DVP basis and the receivables of the member are pledged against its obligations as collateral. If the failure amount is higher than the value of the pledged securities, the member s collateral with the ISE is used. Risk management exists and financial sources are employed, in the form of a special fund and in the form of pledged assets and collaterals of the participants, to finalize settlement at the earliest extend, in case of such failures. 4. Does the CSD ensure that timely settlement can be completed in the event of an inability to settle by the participant with the single largest obligation? If so, how? Yes. 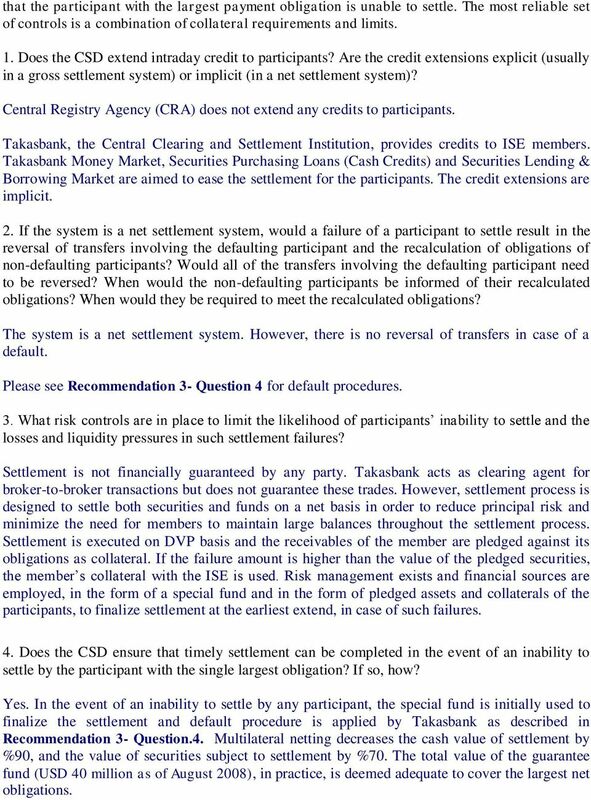 In the event of an inability to settle by any participant, the special fund is initially used to finalize the settlement and default procedure is applied by Takasbank as described in Recommendation 3- Question.4. Multilateral netting decreases the cash value of settlement by %90, and the value of securities subject to settlement by %70. The total value of the guarantee fund (USD 40 million as of August 2008), in practice, is deemed adequate to cover the largest net obligations. 16 Furthermore, as a settlement rule, participants settlement receivables are initially blocked by Takasbank until the obligations are fulfilled. In the case of an inability to settle, these blocked assets are subject to buy-in as per the default procedure. If the blocked assets are not enough to cover the dues in full then the participant s collateral with the ISE is used. These assets and collaterals of the participant together with the guarantee fund of the ISE (an immediate liquidity fund made up of the fines collected from defaulted participants) provide the financial facilities used to finalize settlement in case of a participants settlement failure. 5. Are the credit exposures of the CSD fully collateralized? If not, to what extent and to which participants does the CSD extend uncollateralized credit? Does the CSD have the capacity to value (i.e. mark to market) the securities posted as collateral and apply haircuts? Are limits imposed on credit extensions by the CSD? Yes, the credit exposures of Takasbank are fully collateralized. Credit exposures of Takasbank are managed by the Credits Department, financial ability of the participants is continuously monitored and credit lines are assigned accordingly. Extended credits (cash credits and Takasbank Money Market) are fully guaranteed by the collaterals taken from the participants such as bank Credit Letters; and liquid assets (stocks, bonds and bills, cash, mutual funds and etc.) on transaction basis. Haircuts are applied to each type of security taken as collateral. The collaterals are marked to market daily by Takasbank and margin call is made if the value of the collateral falls below the required collateral ratio. 6. Does the CSD permit debit balances in securities? No. Neither overdraft nor debit balance in securities is permitted. 7. Has any CSD participant been unable to settle any obligations to the CSD? How did the CSD handle the default? Yes. 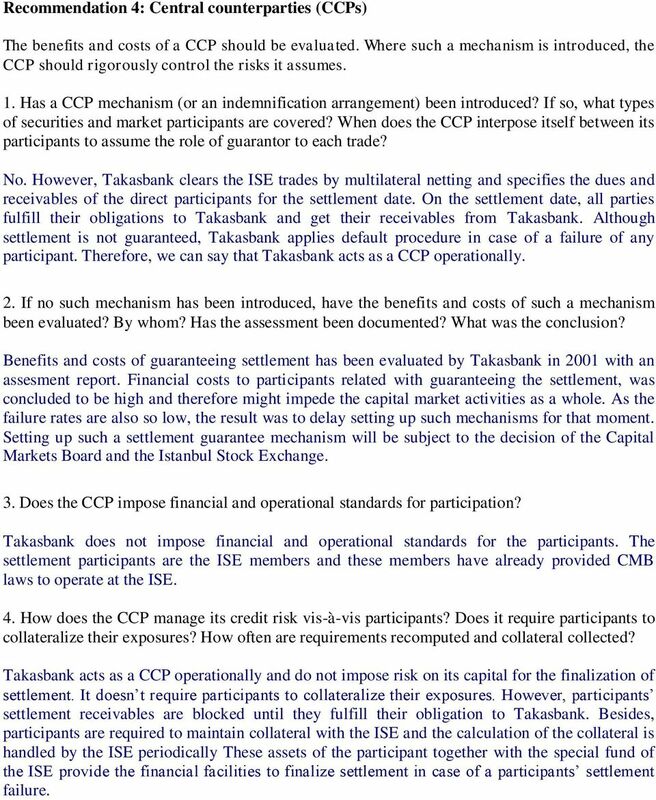 The default procedures, which are applied by Takasbank, are explained in Recommendation 3- Question 4. Recommendation 10: Cash settlement assets Assets used to settle the ultimate payment obligations arising from securities transactions should carry little or no credit or liquidity risk. If central bank money is not used, steps must be taken to protect CSD members from potential losses and liquidity pressures arising from the failure of the cash settlement agent whose assets are used for that purpose. 1. How is the settlement of the cash leg of securities transfers affected? Is the settlement effected through transfers on the books of a central bank, a CSD organized as a limited purpose bank, or one or more financial institutions? Cash leg of settlement is affected through Takasbank. 17 Takasbank, the former CSD for equities; clearing and settlement center for the Istanbul Stock Exchange (ISE), was organized as a limited purpose bank in 1996 dedicated to securities services. Takasbank cannot take deposits or trade at the (ISE) markets. 2. If a single bank is used, is it the central bank that issues the currency? Is the CSD itself organized as a limited purpose bank? If the central bank is not used, what steps are taken to protect CSD members from failure of the settlement institution? A single bank, Takasbank is used and Takasbank is organized as a limited purpose bank. Takasbank, as the clearing and settlement center for the ISE, handles cash settlement via its membership to the national payment system (Central Bank s EFT system). The EFT (Electronic Fund Transfer) system is a real-time gross settlement (RTGS) system developed and operated by the Central Bank of Turkey for clearing Turkish lira payments in the Turkish banking system. Only banks incorporated in Turkey are eligible to be members of the EFT. 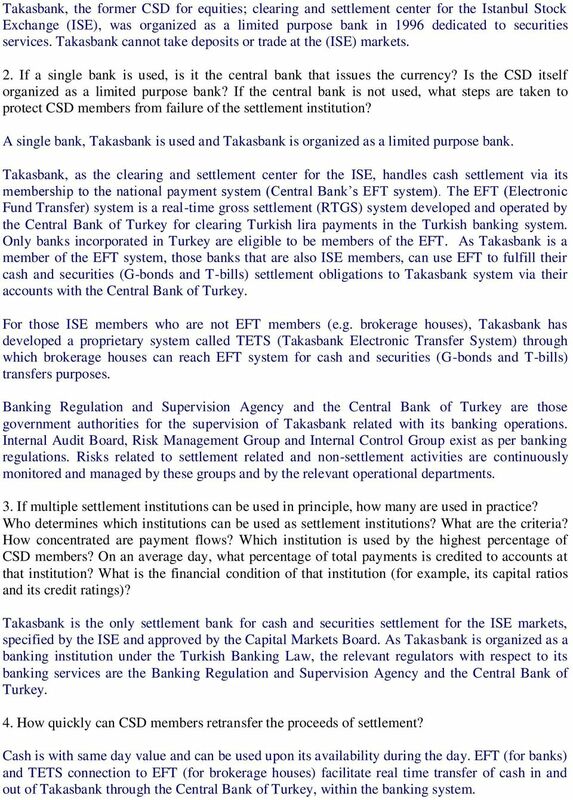 As Takasbank is a member of the EFT system, those banks that are also ISE members, can use EFT to fulfill their cash and securities (G-bonds and T-bills) settlement obligations to Takasbank system via their accounts with the Central Bank of Turkey. For those ISE members who are not EFT members (e.g. brokerage houses), Takasbank has developed a proprietary system called TETS (Takasbank Electronic Transfer System) through which brokerage houses can reach EFT system for cash and securities (G-bonds and T-bills) transfers purposes. Banking Regulation and Supervision Agency and the Central Bank of Turkey are those government authorities for the supervision of Takasbank related with its banking operations. Internal Audit Board, Risk Management Group and Internal Control Group exist as per banking regulations. Risks related to settlement related and non-settlement activities are continuously monitored and managed by these groups and by the relevant operational departments. 3. If multiple settlement institutions can be used in principle, how many are used in practice? Who determines which institutions can be used as settlement institutions? What are the criteria? How concentrated are payment flows? Which institution is used by the highest percentage of CSD members? On an average day, what percentage of total payments is credited to accounts at that institution? What is the financial condition of that institution (for example, its capital ratios and its credit ratings)? Takasbank is the only settlement bank for cash and securities settlement for the ISE markets, specified by the ISE and approved by the Capital Markets Board. As Takasbank is organized as a banking institution under the Turkish Banking Law, the relevant regulators with respect to its banking services are the Banking Regulation and Supervision Agency and the Central Bank of Turkey. 4. How quickly can CSD members retransfer the proceeds of settlement? Cash is with same day value and can be used upon its availability during the day. EFT (for banks) and TETS connection to EFT (for brokerage houses) facilitate real time transfer of cash in and out of Takasbank through the Central Bank of Turkey, within the banking system. 20 to ensure that they will not become subject to claims of the custodian s creditors (for example, is segregation used)? Are those arrangements based upon specific laws and regulations? In the event of the custodian s insolvency, do those arrangements enable a customer s positions to be moved by a receiver to a solvent intermediary? CRA participants are required (by law) to segregate assets held for their own benefit and those they hold for their clients. As a result, creditors have no right on customers securities. Those arrangements are based on Article 10/A, 46/A and 46/B of Capital Market Law, Gradual Liquidation Regulation, Investor Protection Regulation The Regulation Concerning Incorporation, Operation and Supervision of the Central Registry Agency, Communiqué about Terms and Conditions Governing Book-entry Recording of Dematerialized Capital Market Instruments and relevant decrees of the Capital Market Law. In the event of the custodian s insolvency, customer positions would be moved to an intermediary to be defined by the insolvent institution or by the liquiditator. In case of the loss of any client of the participant which is subject to gradual liquidation, indemnification out of the Investment Protection Fund is set forth. Moreover, CRA allocates a unique CRA identity number and pin code for each account holder and mails them to investors directly. By identity number and pin code, investors can login CRA Investor Web Site, CRA Interactive Voice Mail System and can get help from CRA Call Center to control and check their balances kept in CRA system against any possible loss or misuse cases. They can also put investor blockage on their accounts via above-mentioned CRA features which freezes their accounts against misuse by intermediaries. A new feature called (e-cas: Electronic Customer Alert System) is also available for investors. Once they login and fill an electronic form, every transaction regarding their accounts can be reported them via SMS or . The physical certificates of the dematerialized securities are still under the custody of Takasbank and the insurance policy in order to protect customer s securities from theft, loss or misuse remains the same. The insurance policy is organized in two parts. The first part mainly covers operational issues and related with falsification, misuse, breach of fidelity and computer crime with an insurance of USD 5million in total. The second part covers losses related to securities under safekeeping with an insurance of USD 97.5 million. The length of coverage in force is 1 year, rolling over. The deductible amount is USD for each case of loss. 2. Are the entities holding securities in custody subject to mandatory internal or external audit, or both, to determine if there are sufficient securities to satisfy customer claims? On how many occasions during the past year have investors suffered losses as a result of their custodian? How large were the losses? What were the causes of such losses? The participants holding securities in custody are issuers, banks, intermediary institutions, Takasbank and Portfolio Management Companies which are subject to internal and external audit (Capital Markets Board, Istanbul Stock Exchange). There were no such occasions in which investors suffered losses during the past year. 3. How often do the entities holding securities in custody reconcile their records? ASSESSMENT OF EUROCLEAR FINLAND OY. Based on the ESCB-CESR Recommendations for Securities Settlement Systems issued in May 2009.
: Version 1.0 Table of Contents 1. Document History... 3 2. Introduction... 4 3. Definitions... 4 4. Features of the DFM SLB Business Model... 6 5. Restricted Transfers of Borrowed Securities... 15 6. Reform of the Registry, Clearing and Settlement System 24 September 2014 CONTENTS 0. INTRODUCTION I. MAIN CHANGES INTRODUCED BY THE REFORM II. CENTRAL COUNTERPARTY (CCP) FOR EQUITIES 1. INTRODUCTION 1.1. WORKING GROUP ON DISCLOSURE FRAMEWORK FOR SECURITIES SETTLEMENT SYSTEMS. CMU is located in Hong Kong. The time zone is GMT + 8 hours.